Cost: Tickets start at $25! You can purchase tickets here. 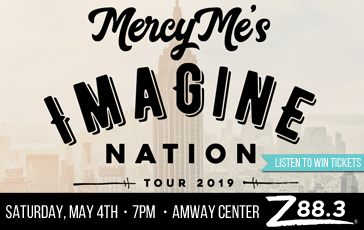 Mercy me, are we excited for Saturday, May 4… because as you may have guessed, MercyMe is coming to the Amway Center and your Z would love to send your family to enjoy the show! Cool, right? You’ll be able to enjoy some of your favorite songs on the Z (Even if, Grace Got You, and of course, I Can Only Imagine!) together, live. Z Artists Crowder and Micah Tyler will be there to perform for your family as well! It’ll be an amazing night, with your friends Ellis and Tyler from Z88.3 Mornings there to enjoy the show with you. Your Z is giving away a family four pack of tickets to see MercyMe at The Amway Center on Saturday, May 4 starting Tuesday, April 16 beginning with your friends Ellis and Tyler! Be our twelfth caller at 407.682.8888 when they make the announcement! You’ll have four chances each weekday and another chance each day of the weekend to call in. Your last chance to win will be Friday, May 3, so make sure you are listening. This is another way we get to say thank you for making Z88.3 your radio station. For a complete list of contest rules, visit our contest rules page.